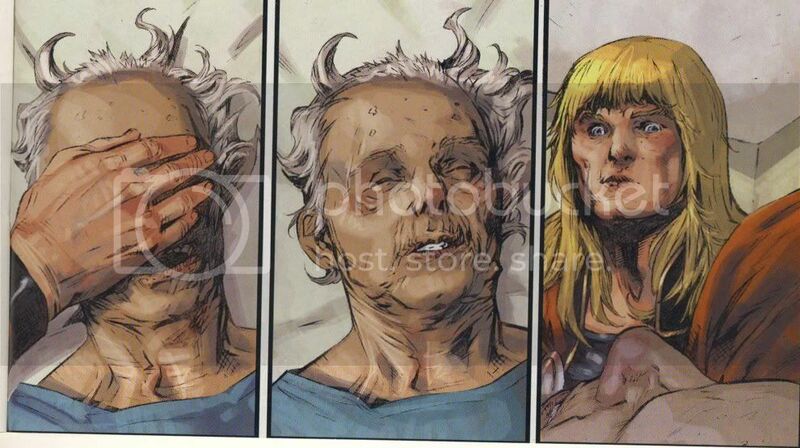 My excitement over the prospect of Doctor Strange is diminished by my weariness with origin stories. Do we really need another one? The story behind how a superhero became a superhero is almost always more interesting than anything the superhero does after becoming a superhero (with the possible exception of Superman about whom there is nothing interesting). I feel like some of you might enjoy this series of posts... This one, for example, is talking about how Captain America was updated for the 60s, and how a guy from the 40s is such a liberal even in modern times (while most liberal men in the 40s would be conservative by today's standards in many ways). I don't really agree. Superman (like Captain America) is interesting not for what he can do, but for his morality, his love of all people, and the inspirational effect he has on others. Good writers understand this. 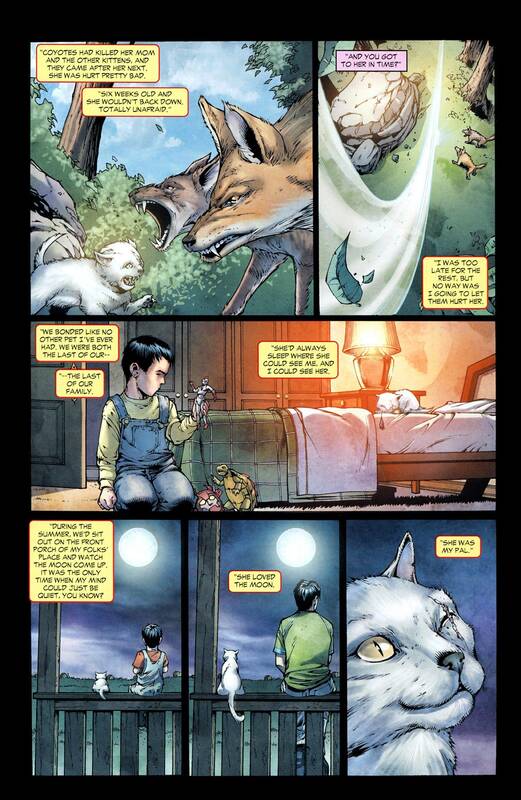 Not the best Superman story, by any means, but this scene neatly encapsulates what Superman is all about. 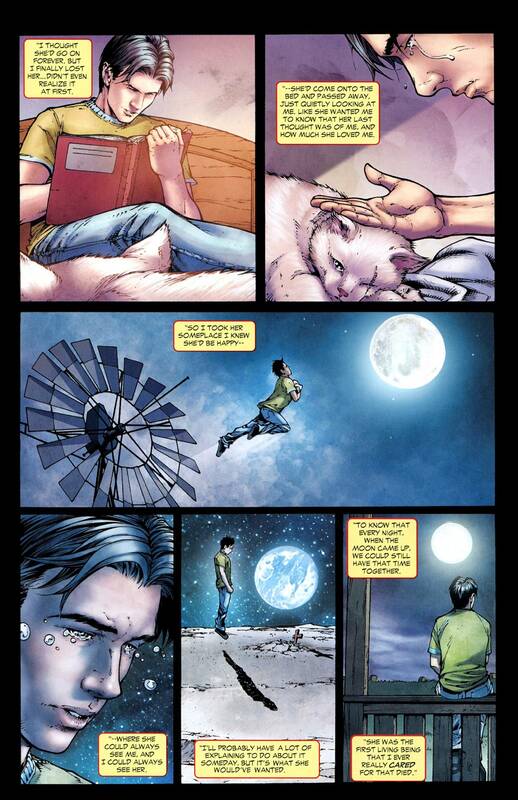 A similar scene from All Star Superman. 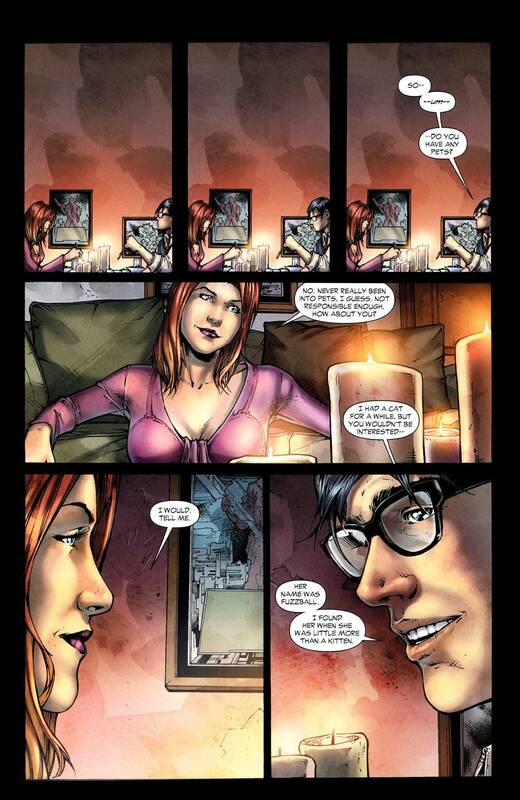 For reference, Superman is dying in this scene, and he knows it. (Long story.) Even so, he takes time out of his very busy day to do some good. To continue the thought: One of the reasons I like characters like Thor is not specifically because of their power or how they deal with challenges (Thor can literally lift mountains; there's very little that can challenge him physically), but how they deal with the responsibility that comes with such power. 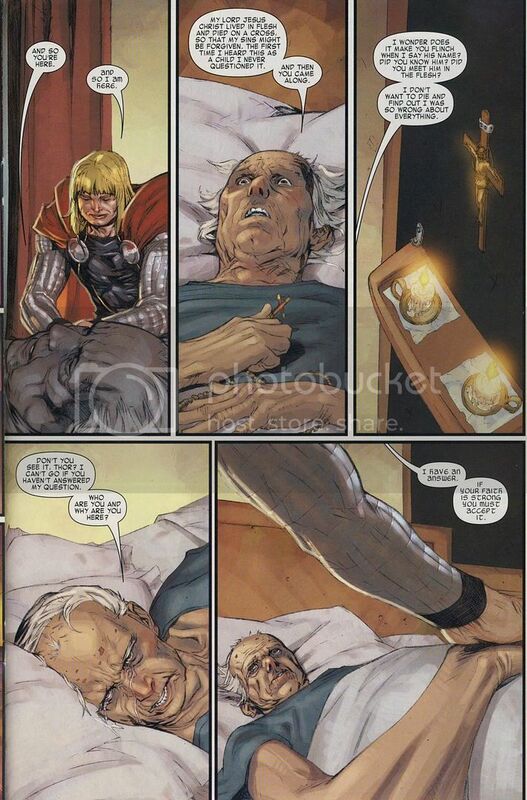 For instance, I like this story of how Thor comforts a dying priest. 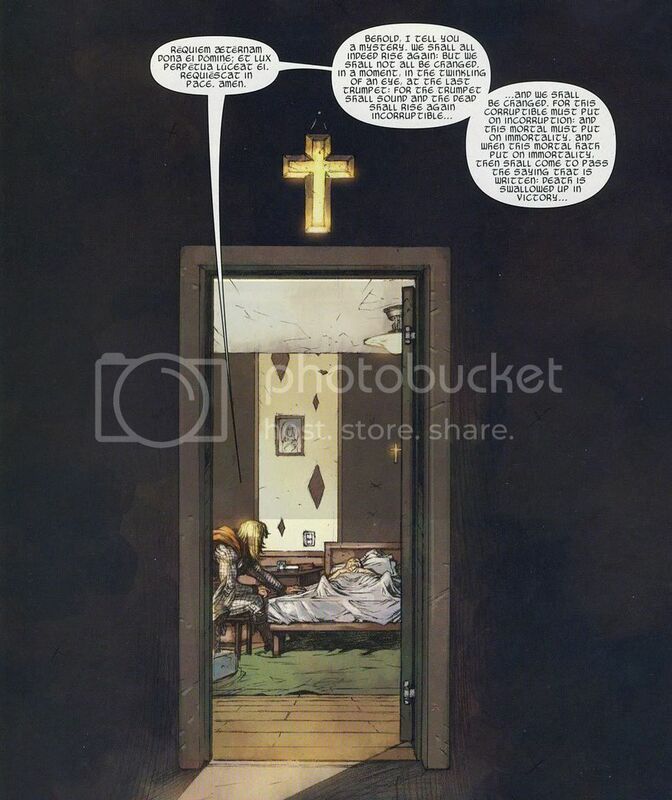 Said priest finds Thor's very existence troublesome, since Thor's existence makes the priest question his own beliefs. 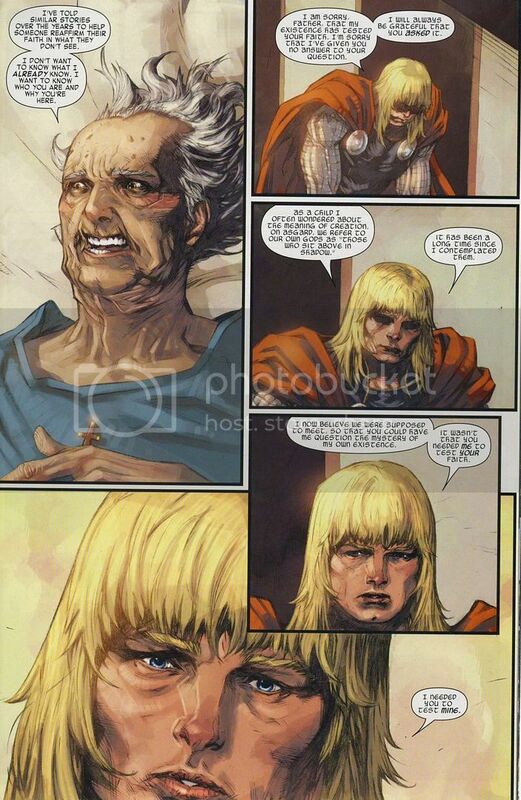 Again, what makes Thor so interesting (to me, anyway), is his decency and his compassion, and how he chooses to use his great power for good, not that he can shatter planets with a single blow of Mjolnir. 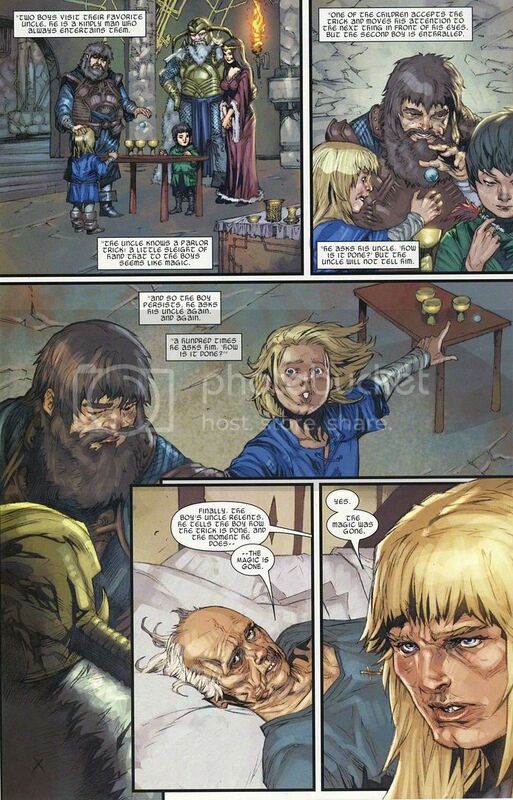 Was that artist making a special effort to make Thor look ugly or is he just crap? Yeah, the artwork is pretty danged awful, especially Thor's look of -- surprise?, confusion?, WTF? -- when the priest dies. 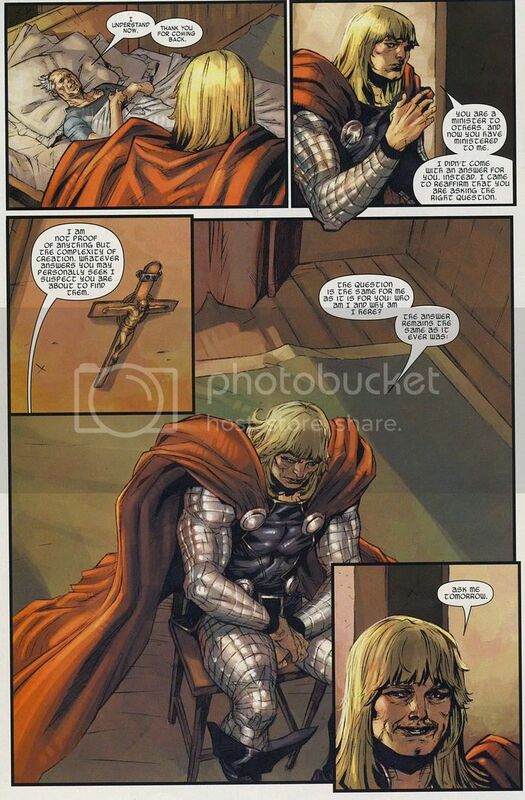 It's especially weird because the artist seemed to go to considerable effort, and put a great amount of detail in the drawings, yet made Thor look just terrible. That bit with Superman and the lady who wanted to jump... I know this is going to sound stupid as hell, but that actually kept me alive. I do exactly what they wrote, and exactly what he said. I picture that happy day that I still believe could happen, and for that day I am still alive as we speak. I just lost my job. I've already lost my love. But I'm hanging on, and that's a god damned good reason why. Thank you for posting that, TLR. Last edited by Megatron; 09-07-2016 at 02:28 AM. No, thank you. There's nothing at all stupid in what you wrote. 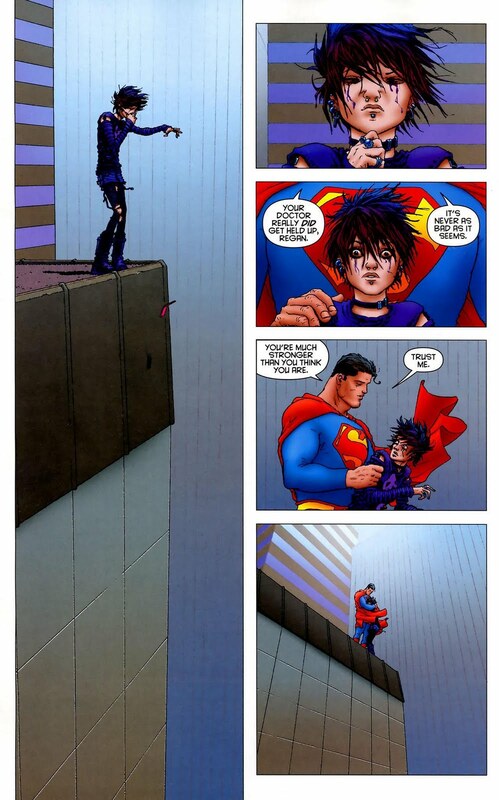 I've read several accounts of how this or similar scenes (the one from All Star Superman, for instance) has inspired people to go on, even when life seemed too dismal and/or hopeless to bear. A big reason why I enjoy [well-done*] superhero stories is because -- while the characters themselves may be fictitious and larger than life -- they remind us that for all of our faults, people can be decent, good, even noble. That's a big part of the reason that life is worth living, it seems to me. And as Superman himself is fond of saying, the real heroes aren't the ones with bullet-proof skin and the ability to lift mountains. The real heroes are the ordinary people who constantly demonstrate that most people are fundamentally kind and decent when you get down to it, and who -- despite their lack of superpowers -- nevertheless find the courage to get out each day and do what must be done. *As opposed, to -- say -- Man of Steel or Batman v. Superman, which managed to miss the entire point of what superheroes are all about. Last edited by The Lone Ranger; 09-07-2016 at 05:12 AM. It's not stupid at all. I've heard it enough times about that panel. Only just starting Marvel's Luke Cage but it's p excellent. It's a different tone than the others, closer to Jones but still its own entity. Through episode 4 you still needn't have seen really anything else in the Marvel extended cinematic universe to get it, though some sporadic references would make more sense. I'm just posting to say my favorite thing so far: The name of the Chinese restaurant - Ghengis Connie's. I couldn't watch last night because there were too many people logged into my niece's Netflix account. I am hoping tonight some of her friends will be out on the town instead of Cage-blocking me. I couldn't watch last night because there were too many people logged into my niece's Netflix account. We made it through the first two episodes last night. Digging it so far. Kind of a slow burn at first, but once things get moving, it picks right up. Glad to see, since I was sort of disappointed with back half of Daredevil's second season. Glad to see, since I was sort of disappointed with back half of Daredevil's second season. Its tough to have kept up with the first season, that created huge expectations for the second, and to be frank, imho, they pretty much met the standard that was set. I'm sure my borter, wei, would partially identify or at least understand my in one of the earlier episodes. Luke is going ham on his chosen enemy and invades their headquarters. At one point in his raid, he sees a bunch of dudes at the end of the hall, he turns a corner and busts into an empty room and waits for the bad dudes to come get him. In the MMO world, City of Heroes most specifically, this is exactly EXACTLY what the Tanker does. He absorbs damage while he gathers the bad guys into a convenient location for them to get facestomped. I WAS DED. And the other was Method Man spitting a rhyme and generating love for the hero. It's thing of beauty. IS LUKE CAGE TOO BLACK? “Lack of white people in Luke Cage makes me uncomfortable. This show is racist, how is this on Netflix?? ?” tweeted one Twitter user. The radical branch of liberalism, the SJWs, will find anything to complain about. When I complained to my niece about it, I actually told her that it was the definition of a First World Problem. Also, I've seen more than half the season now and I'm loving it. I've been musing on this today and I think what I like most about the Netflix Marvel series is how they are as much or more about the sidekicks journeys than the heroes. I love the way Claire has built and been brought into this world over three shows. She's gone from reluctant helper to deciding she wants this to be her mission, but gradually so it makes sense. And her conversation with Malcolm in Jessica Jones about their place in the scheme of things was one of my favorite scenes in the series. And Foggy is a far more interesting character than Matt in Daredevil, if you ask me. I hope they continue to treat these characters well, unlike the WB shows tending to forget what makes their sidekicks interesting. Finished Luke Cage and I also really enjoyed it. Like Adam said it is a slow start, but gets moving nicely after that. If Daredevil season 1 is a 10, I would give this a solid 8. Loved that it was a show set in Harlem and therefore black orientated. Made even tastier by the whiny tears of the internet basement dwellers. The ending pissed me off though. The show is quality, we're all coming back for season 2. There was no need to end on a massive cliff hanger and leave almost everything unresolved. There are TWELVE episodes in season 1 of Luke Cage, for some reason when I was downloading them I stopped at 10. So that means a) maybe some things ARE resolved, dumbass! and b) I GET TO WATCH 2 MORE EPISODES!